"How do I make it so I don't have to tell my story over and over again to all these agencies who are involved in helping my family?" Sometimes being involved with more than one service can feel overwhelming. Having to tell your story over and over again can grind you down and can feel like one more problem to solve. 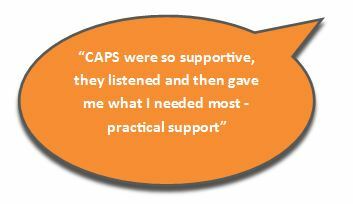 At CAPS we can get everyone together with you and your family's goals at the centre through the Strengthening Families process. This process is all about sharing information once with everyone working to support you in a coordinated way. Contact us if you wish to learn more about Strengthening Families.